An independent, different retail offer in Rotherham town centre is nothing new as Mesmerize, Rotherham's premier alternative store, celebrates its 20th year in business in this weekend. 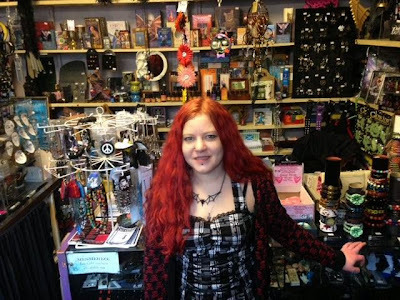 The shop opened for the first time on May 8, 1995, and has proved to be enduringly popular with shoppers to the town searching for more alternative gifts and jewellery. Starting on a stall on the old outdoor Rotherham market, the store is now based on Wellgate and was last year was named Rotherham Town Centre's "Independent Retailer of the Year" - an award voted for by the public. Over the years, the range of items sold has expanded to include Gothic and alternative clothing as well as a large range of aromatherapy oils, incense, home fragrances and licensed Nemesis artist collections and figures. Mesmerize is also a popular venue to buy tickets for local gigs and concerts. Lynda Crampton, owner of Mesmerize, said: "I received help from Business Link and the Prince's Youth Trust to open a bricks and mortar shop and I am still here today 20 years on thanks to the incredible continued support from Rotherham shoppers. "I am very proud to be trading in Rotherham town centre. I have made many new friends over the years and I would really like to thank all my great and loyal customers for their support over the past two decades." Many of these customers helped Lynda celebrate last month at a special anniversary bash attended by 300 people, which included a host of live music and entertainment including local band Papa Legba's. The store is running offers and a raffle as celebrations continue.